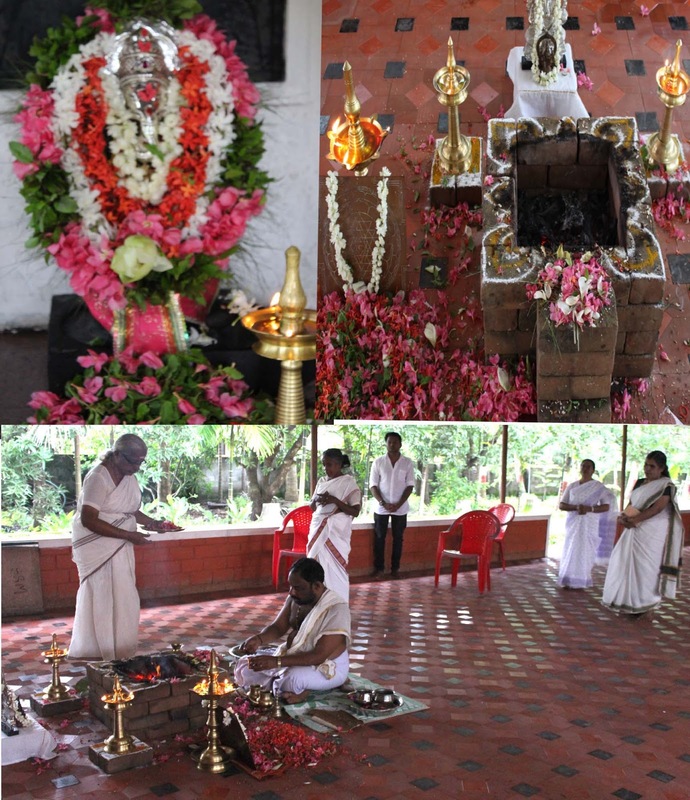 On 9th July, the auspicious day of Gurupurnima, there was the usual Ganapathy Homam and Sreecakra puja, in the early hours of the morning as performed in all Purnima days.The inmates of Anandadham and a few well wishers were present. At 10 a.m Pada Pooja of Mananneeya Lakshmi Didi by the tiny tots of Sandeepani Sishuvihar and their parents was arranged.The children came with their parents for the programme. 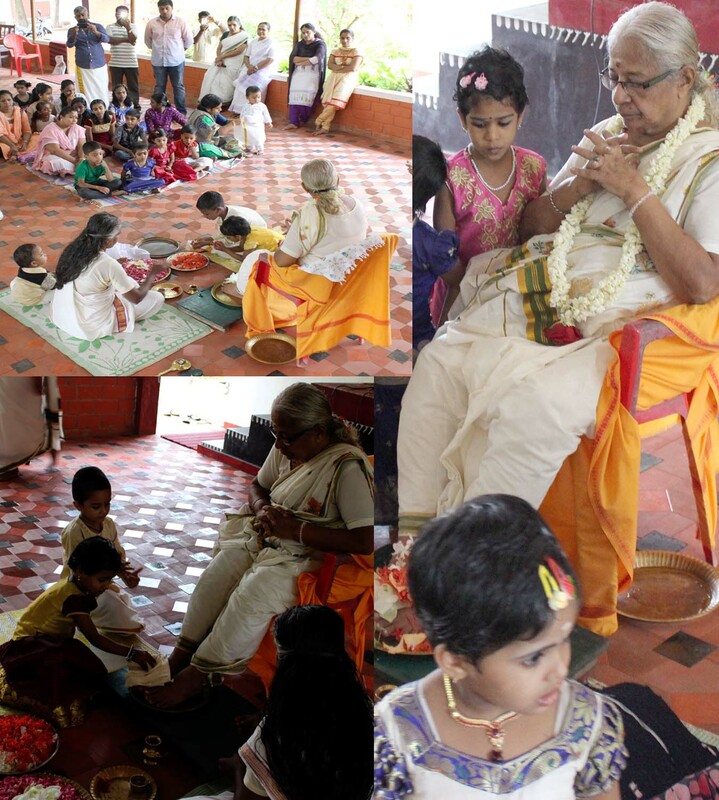 Along with them, Samskarvarg children and SKIE students too took part in the programme. In the evening on the same day at 3.30p.m,. the Yoga Varga and Yoga Satra participants and well wishers took part in chanting of Guru stotram lead by SKIE student Srilakshmi of class X. Ma.Didi explained the Guru Stotram and relevant stanzas from the Kendra Prarthana to clarify the idea of surrender or 'atmanivedanam'. 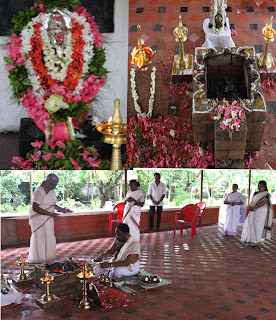 Each of the participants offered flowers in front of OM. 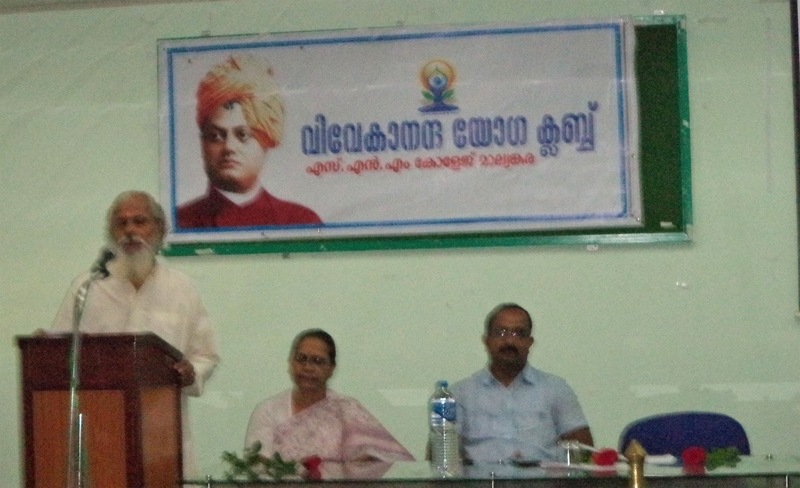 Swami Vanishanandaji of Ramakrishna Math Kayankulam was the Chief Speaker. He spoke on the importance of 'Guru' quoting from the Kathopanishad. A video of Sri Narayan Guru's Daivadashakam was shown after that. 75 people attended the evening programme. 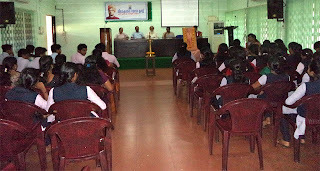 On 10th July, as a part of Gurupurnima celebration, inauguration of a yearlong certificate course on yoga for the degree students of SNM, College Maliankara, was organised by the teachers of the college who are members of the Vivekananda Yoga club which was started five years ago by Vivekananda Kendra Vedic Vision. Sri Sudhakarji and Su. Sutapa along with two Yoga Varga karyakartas who will be handling the classes, were present for the inauguration session. Fifty II and III-year Degree students, who showed interest in the course were present. Classes are to start from 11th July-Tuesday. Every Tuesday and Thursday there will be classes.